Prominent & Leading Manufacturer from Faridabad, we offer pre fabricated factory shed, prefab steel shed and prefab industrial shed. Pre Fabricated Factory Shed offered comes in sturdy and lasting construction finish and can be made available in different design specifications to choose from. 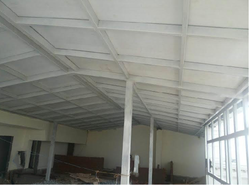 Further, these prefabricated structures comprise steel framework linking up H section, Z section and U section and can be provided with options for different types of roof and wall options as demanded from us. Some of its features include available in superior grade steel finish for lasting durability; column & beam comprising welded or hot rolled H-section steel; wall & roof support provided in form of EPS, Rockwall, PU sandwich panel and others. We are one of the widely known manufacturers, suppliers and exporters of Prefab Steel Shed. The offered steel sheds are quickly installed units, which are fabricated from steel frames, pillars and pipes. Our supplied steel sheds have laminated fiberboard walls, which are fully insulated by thermocol puff. The manufactures steel sheds are strong enough to withstand the harsh climatic conditions and rough weather. 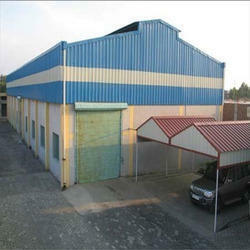 We are one of the widely known manufacturers, suppliers, and exporters of Prefab Industrial Shed. The offered industrial shed is widely used in the industrial sectors, for creating a closed production enclosure. 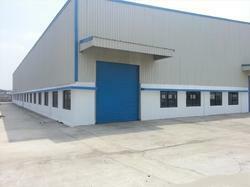 Our supplied industrial shed is able to provide shelter to goods, machinery, and labor in the industry. The offered industrial sheds are provided with epoxy-coated fiberboard walls, for enhanced strength and protection.